Printing is the last thing ecommerce business owners want to waste time on. Fiddling with document sizes and cropping. Fitting multiple postage labels onto one page. Printing over and over and over again when the printer keeps spitting out labels in A4 when you wanted them in A6. Printing can be a major time waster. In fact, according to a recent research project from business experts Inc.com, 3.2 hours per working week are spent on low-value interruptions – like printing. 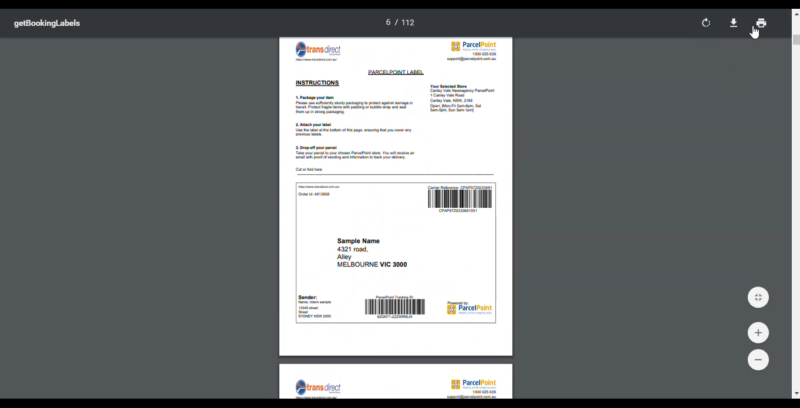 At Transdirect, we aim to streamline tedious little administrative jobs like printing, so we’ve set up flexible, customisable printing in our exclusive Member’s Area, so you can print multiple postage labels from one PDF and print in multiple sizes (A4, A6) with ease. Spend less time fiddling with the printer – learn how to get the most out of the Member’s Area with our video tutorials below! To print multiple labels on one PDF, log into Transdirect’s Members Area and navigate to “Bookings”. Within the “Bookings” section, select the “History” tab. If you want to select labels from a specific date, use the drop-down date selector menu to select a date. In this example, we’re going to select the 21st of August, 2018. 2. After selecting the date range, you will have access to all the order information from this time period, including consignment labels. To print these from one simple PDF, navigate to the blue “Print All Labels” drop-down menu on the left-hand side of the page. In this example, we selected “A6 label” as the format – however, this is up to you. 3. You will be redirected to a printing page. You will have multiple labels on one page and you can either download these labels or you can print them from the top right side of the page. At Transdirect, we like to make running a business – as well as shipping – flexible. In the Members Area, you can print labels in both A4 and A6 format, depending on your personal or professional preferences. To do this, navigate to “Bookings” in the Members Area. In “Bookings”, select the “History” tab. 2. In “History” you will see all of your previous order information including labels. To print a label, navigate to the “Actions” column and use the drop-down menu to select “Print Standard Label” for A4 labels, “Print A6 Label” for A6 labels, “Print Manifest”, or “Return Label”. In this example, we’ve decided to print an A6 Label. 3. You will be redirected to a printing page. You will see the return label in your chosen format – in this example, the label is in A6. You can now choose to either download the label or print it using the symbols in the top right corner, as highlighted below. Not a member of Transdirect? Pick up the pace with your eCommerce business and become a member now!